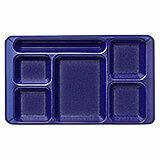 Cut dishwashing labor and expense in half with our 2 x 2 Compartment Trays. 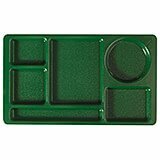 The unique design lets you fit 18 trays, side-by-side in a standard dish rack. Gradual slope on compartment walls promotes faster drying. 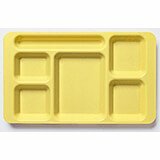 2x2 break-resistant co-polymer Trays. The unique design lets you fit 18 trays, side-by-side in a standard dish rack. This saves on water and chemical expense. Gradual slope on compartment walls promotes faster drying. 2x2 virtually unbreakable Polycarbonate Trays, great for high volume locations to withstand heavy use. 5 square food compartments, 1 silverware compartment. 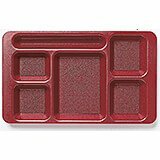 Cut dishwashing labor and expense in half with our 2 x 2 Compartment Trays. The unique design lets you fit 18 trays, side-by-side in a standard dish rack. This saves on water and chemical expense. Gradual slope on compartment walls promotes faster drying.Easy grip handles provide a more secure grip for children with smaller hands. Virtually unbreakable Camwear polycarbonate. 4 square food compartments, 1 round food compartment, 1 silverware compartment. Cut dishwashing labor and expense in half with our 2 x 2 Compartment Trays. The unique design lets you fit 18 trays, side-by-side in a standard dish rack. This saves on water and chemical expense. Gradual slope on compartment walls promotes faster drying.Easy grip handles provide a more secure grip for children with smaller hands. Virtually unbreakable Camwear polycarbonate. 4 square food compartments, 1 round food compartment, 1 silverware compartment. Cut dishwashing labor and expense in half with our 2 x 2 Compartment Trays. The unique design lets you fit 18 trays, side-by-side in a standard dish rack. This saves on water and chemical expense. Gradual slope on compartment walls promotes faster drying.Easy grip handles provide a more secure grip for children with smaller hands. Break-resistant co-polymer. 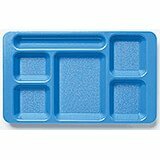 Co-polymer trays are not NSF listed. 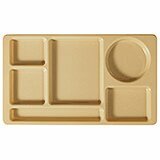 5 square food compartments, 1 silverware compartment. 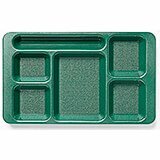 Cut dishwashing labor and expense in half with our 2 x 2 Compartment Trays. The unique design lets you fit 18 trays, side-by-side in a standard dish rack. This saves on water and chemical expense. Gradual slope on compartment walls promotes faster drying.Easy grip handles provide a more secure grip for children with smaller hands. Virtually unbreakable Camwear polycarbonate. Translucent colors are NSF listed.